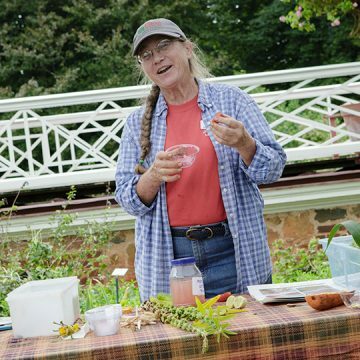 Pat Brodowski, specialty gardener at Monticello, plants and maintains the plantation’s two-acre kitchen garden comprising heirloom vegetables and herbs. She researches and grows varieties most likely grown by Thomas Jefferson and produces seeds for The Shop at Monticello. She received bachelor’s degree in agriculture from Cornell University and was an educator and historian at a 19th-century farm museum for eight years. She recently researched the history of Jefferson’s herbs and salad greens for her master’s degree.